A few autumn leaves still cling to tree branches; although most have fallen blanketing the trails with a carpet of color. Thanksgiving approaches and looking back on the year, a few events stand out as unforgettable. The summer proved to be wet and rainy except for a stretch of super-hot, arid days from June into July. One balmy afternoon, Karen and I rode down a grassy expanse near a string of telephone poles which led to a bog, deep mud and a few strange swamp plants. Turning into a lush field, Pepper quickly outpaced CJ stepping through a sea of waving grass. The afternoon sun beat down on us and CJ dripped sweat. We approached the entrance to the woods and the cool shade. Suddenly, CJ stopped in the tall grass, tucked his legs under his belly and instantly I felt my feet touching the ground. The horse sat quietly in the high grass as I stepped off his back thinking he was injured. Pulling on the reins, I tried to make CJ stand up. “That can become a bad habit. I’m reading a book on horse vices and lying down is one of them,” she said. “I never heard of that,” I replied adjusting my position in the saddle. “It’s a bad one. I used to have a horse that laid down all the time. It was a pain,” she said turning Pepper towards the woods. “What did you do when your horse went down?” I asked. A few weeks later, Emma and I rode to the same isolated section of the park near the grassy field and abandoned farmhouse. The freshly mowed grass smelled sweet on the hot afternoon air. We stopped the horses. CJ, covered with sweat, bent his neck down and ate grass as I took a series of pictures. Pepper nibbled the grass a few yards away. Suddenly, CJ again tucked his legs under and I felt him collapse beneath me. This time I jumped off, yelled, pulled his head up and smacked the whip against his neck. CJ attempted to roll but didn’t make it over. The saddle and my pulling, screaming and whipping impeded him. Emma and Pepper looked on in amazement. CJ gave up and clamored to his feet. He calmly waited for me to remount as I swung my foot into the stirrup and sat back in the saddle. “That’s the second time he’s tried that,” I said. “What was he doing?” asked Emma. “Trying to roll, Karen said it can become a bad habit, and I think she was right,” I replied. “It looked like he was dying,” replied Emma. “I know. That’s what I thought the first time he tried to roll,” I replied. “I think Pepper was surprised. She just stared at CJ and stood very still,” said Emma. “It’s too bad she can’t talk,” I said. “She seemed very intent on what CJ was doing,” she replied. A couple of hot summer days passed by, Emma and I rode through the cool trails in Round Top Park and headed home down Weaver Road. The late afternoon heat drifted on the air. When we reached the Slocum pastures, Pepper and CJ stepped onto a wide grassy expanse alongside the road. We heard a big truck rumbling down the gravel road behind us. The engine slowed as the pick-up approached. Pepper, in the lead, briefly rubbed her nose on the soft grass. Suddenly, the horse buckled her front legs and she was on her knees. “Emma jump! Jump off!” I shouted as I watched Pepper go down with Emma’s foot under her. “Yes, we’re fine thanks,” said Emma turning to face the driver. “Some people do that but I think the safest thing to do is jump off. She could roll over with you on her. People have died that way,” I replied watching Pepper nuzzle her arm, as Emma gathered the reins and remounted. “I can’t believe she did that,” said Emma. “Maybe she learned it from CJ,” I said. “After CJ tried rolling with me a few days ago, I looked up rolling horses on the internet and discovered three ways to deal with the problem. I think the safest method is to jump off,” I said. “What are the other methods?” asked Emma. “One is stay in the saddle and get the horse to stand up,” I said. “That doesn’t sound like a bad idea,” she replied. “It’s ok, if you’re fast enough and manage to get the horse to stand up before he starts rolling. But once he goes into the roll, you could find yourself pinned under the horse. 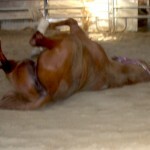 People have died when the horse rolled over on them, especially in a western saddle. The saddle horn impales the rider, not to mention being crushed by the weight of the horse,” I said. “What’s the other method,” she said. “A couple of cowboys said once the horse lays his head down on the ground they place their knee and all their weight on the horses neck near his head. This pins the horse to the ground so he can’t move. The horse soon learns that rolling places him in a vulnerable position and doesn’t try it again,” I said. “That sounds a bit extreme,” replied Emma. “I agree. I think jumping off is the safest,” I replied. We rode on down to the barn, bathed the horses and put them out to pasture. A few weeks later, the heat broke and the summer turned rainy. Emma and I adopted a new policy; don’t let the horse eat grass while mounted and keep them moving. Since a horse needs to get his head down to the ground to roll; not letting him have his head stops the problem from occurring. Neither CJ nor Pepper tried rolling again. Understanding the signs of rolling is equally helpful. 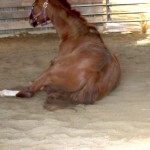 A horse begins the roll by lowering his head, sniffing or pawing the ground or water, and then his front knees buckle. The horse is on his knees, quickly his hindquarters descend and he rolls onto his side. 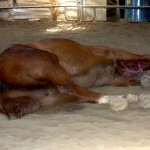 A sweaty horse’s natural instinct is to roll, cool off, and get rid of flies and itches. Of course, horses also roll for the pure joy of it. There are a few places for riders to be careful; tall or soft grass, sand and water, especially when the horse is hot and sticky. Now that winter approaches, we shouldn’t be plagued with this problem; although, another enjoyable place for horses to roll is in the snow! 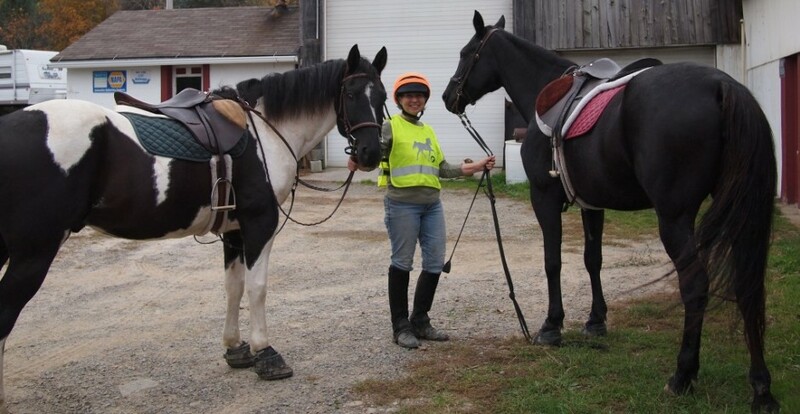 This entry was posted in Uncategorized and tagged rolling horses, trail riding. Bookmark the permalink.